"Based on a traditional Sri Lankan family recipe, this curry is spicy and full of flavor. Try this recipe and you will love it! Serve with basmati or jasmine rice and any other curried dish." Cut the chicken into bite-sized pieces. Combine the vinegar, tamarind juice, 1/4 cup curry powder, salt, and pepper in a bowl. Add chicken and toss to coat. Heat the coconut oil in a wok or frying pan over medium heat. Cook the sliced onion, green chiles, cardamom pods, cloves, curry leaves, ginger, and cinnamon stick until the onion has softened and turned translucent, about 5 minutes. Reduce heat to medium-low, and continue cooking and stirring until the onion is very tender and dark brown, 15 to 20 minutes more. Stir in the garlic and cook for an additional minute. Add the chicken mixture, water, and tomato paste. Stir and simmer until the chicken is cooked through, about 10 minutes. Add the roasted curry powder and stir until evenly dispersed. Chicken breasts simmer in a spicy tomato and yogurt sauce. Roasted curry powder and tamarind juice are available from specialty purveyors or online sources. If curry leaves are unavailable, you may substitute 2 bay leaves. 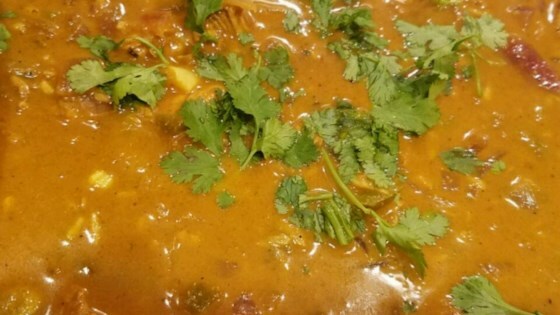 To roast your own curry powder, heat 3 tablespoons of curry powder in an ungreased skillet over medium heat, stirring frequently, until fragrant and slightly browned. Immediately transfer the spice to a bowl to cool. My boyfriend is Sri Lankan and I used this recipe to test out my Sri Lankan cooking ability! He thought it was as good as (if not better) than his parents chicken curries!